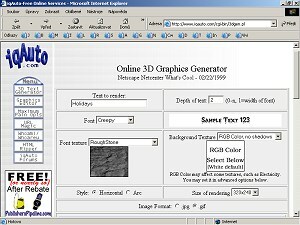 To create your own 3D text you can use an on-line tool which you can find at this page . (You can find the link to this page on our link page for members - and we update it there when necessary). Just fill in the form and the text is finished. To the Text to render field write your text, Depth of text can be set to .2; choose the right font, texture and background as you wish. For now we recommend to use simple colors which are good for anaglyphs - for example RoughStone as a texture and white background. Set the Style as Horizontal, the size (for now) as standard (320 x 240), gif picture. Angle of arc can be set as 0 (but it shouldn't be necessary), vertical camera shift should be 0, horizontal shift for left picture -2 (and for the right one later +2). Other fields can be set as standard - Background Distance/None, Shadows/No, RGB 255, Special Effects 0. Then press the Submit for Rendering button. Wait aproximately 10 seconds - and the you should get your text. Click to it with the right button of your mouse and save it to your disk. Press the Back button of your web browser twice, set the horizontal shift of camera to +2 for the right picture and create it. Now just load your left the left and right pictures to 3DJournal software and create an anaglyph - 3D picture with your text. If you want to use a 3D text in some of your photos, just insert it there - make a collage - as described in this article about collages.